5. ART RACES MAKE EVERYTHING BETTER. All of these are magnificent! You know what? 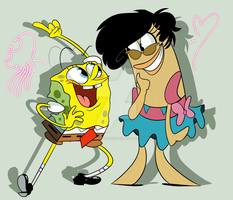 I really do think Spongebob needs a love interest in the newer episodes. Something like this. At least then there would be some form of improvement in the series. 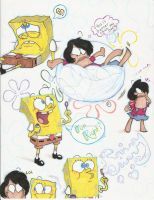 I love the way you draw Spongebob. He looks all squishy and without a vertebrae. wait... what does she turn into in july? omg i lav the pic when u draw sqiud and hes like whoa! Funny to watch him drool. .......are you telling me that you're under 18 and your art is THIS AMAZING???? THESE ARE ALL SO AMAZING! I KNOW I SAY THIS TOO MUCH, BUT YOU NEED TO MAKE AN EPISODE! IT'D BE THE BEST THING EVER! THAT SQUIDWARD THING WOULD FIT SO WELL! OH GOD, YOU HAVE SO MUCH SKILLZ! I'm not a Spongebob fan... but these are GOOD. IT'S NOT RIGHT HERE, DOWN THE STREET OR UP ABO-OVE! lol, at the end. 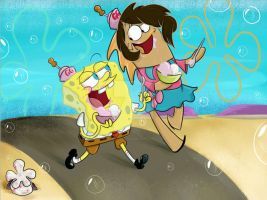 That couple was probaly the first crack couple I suported when I was like 7. Good drawings! You're awesome with sai! "You mean to tell me.... You're not legal yet? I'VE BEEN LIED TO ALL THIS TIME?" The one with Squidward is just awesome. I love the coloring on these. It is so nice and smooth. Holding patrick must be a real workout! and why was spongebob asking if you're turning 18? The resemblance of this to the show is uncanny. And your only 17 AND in college?? Can't believe I'm 2 months older than you...and still in high school. Still, this is really well made. I don't watch a ton of Spongebob anymore, but you're doodles make me want to! Tons of lovey friendship fun! Love these so much - they fill each day with happy. Stay in Bob-land and live foreverrrr! Because you're amazing and I can't draw Bob worth barnacles BUT I LOVE HIM. can't U put up that sweet 18 comic, then? ASDFJKL SAM IS SO AWESOME. AND YOU DRAW SB SO WELLLL. But seriously, I could never ever get tired of your style, it's just so fresh and funtolookat. 8'D And I don't mind the huge chunk of SB fanart, you're the only one I know who does!! Please continue, and the 14th will be a sad day for me when you stop. Why hasn't Nick hired you yet?! You'd be perfect for the SB team!